Pirates of the Caribbean: Dead Men Tell No Tales brings the iconic Jack Sparrow back to the big screen for his fifth adventure in the blockbuster franchise and attempts to right the wrongs of the past few films. Most would agree that the franchise got progressively worse after the groundbreaking first installment and many felt the magic of the world that director Gore Verbinski and Johnny Depp created was lost forever. While the new film looked like an utter cash grab, thankfully Dead Men Tell No Tales gets enough right to prove there are still Pirate tales worth telling. Dead Men Tell No Tales makes a concerted effort to really dig back into what made Curse of the Black Pearl such a great film. It would be fair to argue that this film, directed by Joachim Rønning and Espen Sandberg (Kon-Tiki), tries perhaps too hard to follow all of the beats of that first film, but at this point its a nice course correction to get the franchise back on track – or more hopefully end the franchise on an appropriate note to bookend the series. This film sees Henry (Brenton Thwaites), the son of Will Turner (Orlando Bloom), grow up obsessed to plan a daring mission to free his father from the curse of The Flying Dutchman. His quest points him to finding the Trident of Poseidon, a legendary object of great power that can free the world of all curses. Naturally he must track down the only man who can help him find the object: a more drunk than usual and nearly washed up Jack Sparrow (Johnny Depp). 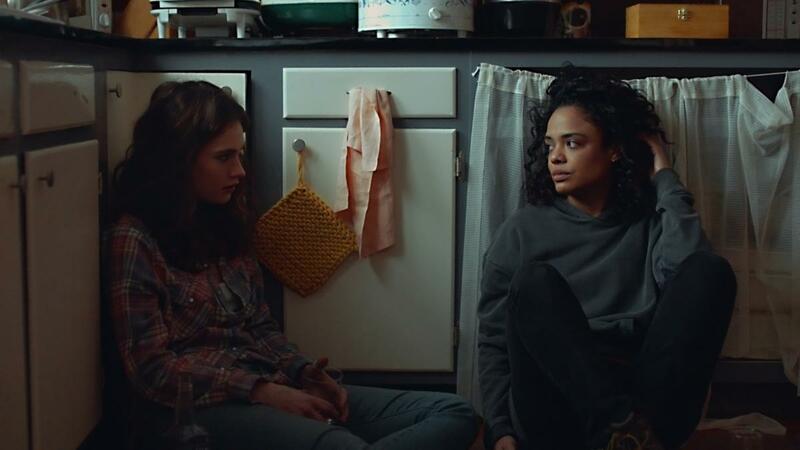 Along the way the group sees the plucky Carina Smyth (Kaya Scodelario) join the search for the Trident to find answers about her father and a mysterious diary she was left with as an orphan. 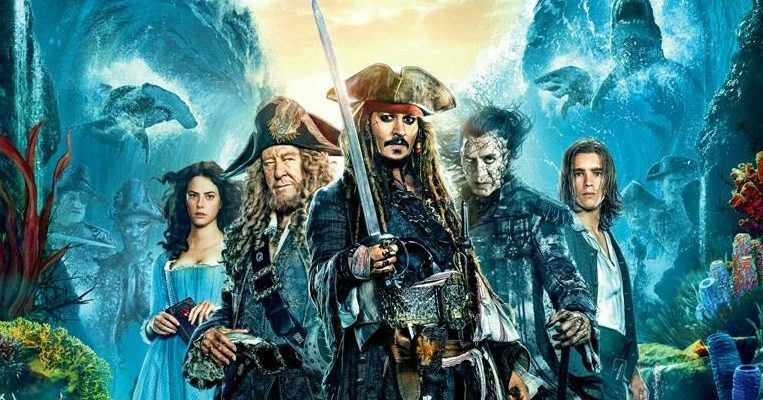 Also joining the crew is the current reigning pirate master of the seas, Captain Barbossa (Geoffrey Rush) after his fleet and crew are decimated by the new supernatural threat of the recently freed Captain Salazar (Javier Bardem) and his ghost crew with a personal grudge against Sparrow. What really works in Dead Men Tell No Tales are the extremely inventive and frenetic action set-pieces that populate the majority of the film. From a ridiculous bank heist on land to the massive carnage in ship-to-ship sea battles, the Pirates franchise has rarely seen more entertaining and gorgeous action sequences. Additionally the designs of Salazar and his crew with their creepy missing ghost body parts and always floating underwater hair (even on land) are some of the high points of the usually stellar design work from the franchise. The story itself also goes the extra yard to make everyone’s missions very personal with new and surprising parts of the characters’ back stories explored. One particular flashback with Salazar and a young Jack Sparrow (with a terrific de-aging CG effect on Depp) is one of the most inspired portions of the film. Having the story come back around to the attempted redemption of Will was also a good decision and will be very satisfying to fans of the series. Pirates of the Caribbean: Dead Men Tell No Tales also has a completely unnecessarily bloated running time at two hours and ten minutes with a great deal of the film that could have been edited down for a smoother, faster paced roller coaster ride. But for those that love the franchise and have been waiting for a return to form, this film is as close as you’re going to get. Despite its numerous flaws, the film delivers some sincerely entertaining summer blockbuster fun and enough of that original Pirates magic to justify this fifth installments existence.